To finish this week on a healthy note I wanted to talk about 5 favorite friday fit ideas!! I did some of them already during the fall season, but I wanted to share some fun health tips with you guys. As it’s friday I am sharing with clare! 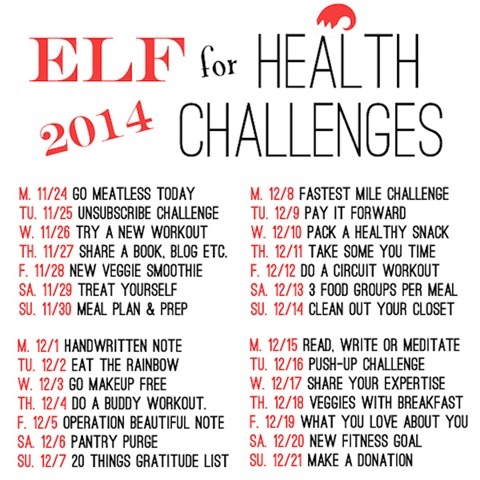 1. joining the elf4health challenge!! I don’t know Iif you guys heard about it , but it’s a very nice challenge held by lindsay and elle during the holiday season!! I am really looking forward to doing the challenge.It lasts about a month and incorporates fitness, health, wellbeing and all sorts of fun challenges! I especially love the fact that it is about different aspects of “living a healthy life” and that it does not only include workouts and eating challenges. It is almost holiday season and I know for a fact that I love to be lazy during that time … days get shorter, chocolate and good food is all around and I often just don’t workout for a month at that time of the year. So by participating in this challenge I am looking forward to, staying active, on track and maintaining good habits during the holiday period. Plus I am thrilled to getting to know fellow elfs, and having fun!! If you’d like to join please visit lindsay’s or elle’s website, you can still join until tonight!! maybe i’ll try it out! I am actually using a withings pulse which you can have in your pocket or hanging on your jeans. As I work at the hospital I am not aloud to have any bracelets so this solution is better for me! I find that when I am tracking my steps. Even if it is not really accurate or whatever , I am engaging myself in moving. and this is a good thing. 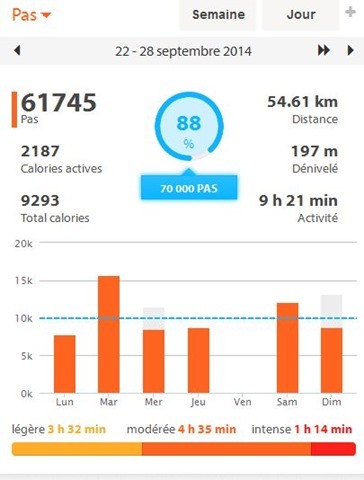 Days I don”t do 10000 steps and I won”’t have the time to do some more steps I try to fit in a quick workout of some sort. Even if it’s just doing some set of jumping jacks , squats and some ab moves , it’s fine by me. Key here is to move! Here is the english version of the website if you want to check it out. There is also a french version of it, if you happen to be in France, like I do. yes guys ! This is my fitness tip. Why? Because feeling good in your workout clothes is key to having good workouts. Back in the days where I used to go running once in the month and that was quite it. I only owned one pair of sport bras, one pair of shorts and I used whatever tshirt I had on hand to practice sports. Maybe, it was enough to go running once a month, but it certainly did not encourage me to practice some kind of sport more often. Last year I asked for “sports gear” as a Christmas gift. BEST Idea ever!!! 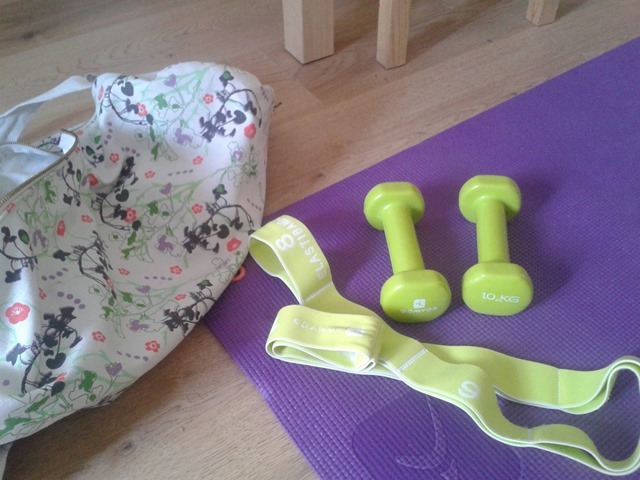 I received a yoga mat, a yoga mat bag, a set of dumbbells and a stretch band. Since it is a gift and a very nice one, I am so happy to use them very very often. It has changed my life for doing abs (better than on the hard floor^^), and I can easily store all my stuff in the nice bag I received. Case in point, if you have all the necessary gear and enough outfits, by that I mean more than one sports bra and probably more than one shorts so you can alternate.. you will find more motivation in doing some fitness. At least , it helped me a lot! So because friday it’s black friday I am going to indulge in some fitness gear ! What are your healthy fitness tips ? I love that challenge at the top! 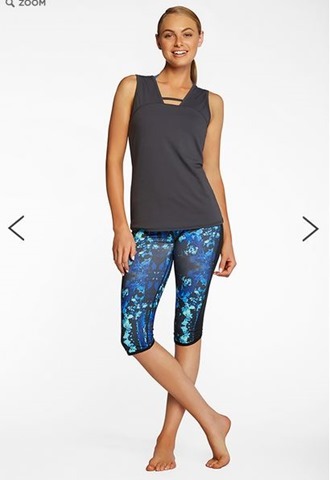 And I am all about cute workout clothes. You should always feel cute.